Police Chief Fred A. Frego and the St. John Police Department are proud to announce our participation in the 2015 "National Night Out". 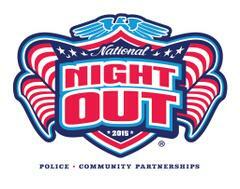 On August 4th, 2015 from 6:00 pm to 9:00 pm, the St. John Police will be hosting a "Night Out" event at Civic Park (9300 block of Civic Drive). There will be food and activities for all. Police equipment will be on hand as well as Police K-9 demonstrations, Specialty Units, and our Child ID program. National Night Out is designed to heighten crime and drug prevention awareness as well as generate support for and participation in local anti-crime efforts. We hope to strengthen community spirit and garnish our community-police partnership. On August 4th from 6:00 pm to 9:00 pm lock your doors, turn on outside lights and spend the evening at Civic Park for a night of food, fun and fellowship. Let's continue to support and strengthen our St. John community pride. Contact Commander David Demeter or Detective Corporal Steven Flores of the St. John police at (219) 365-6032 for further information. We look forward to seeing you on August 4th.